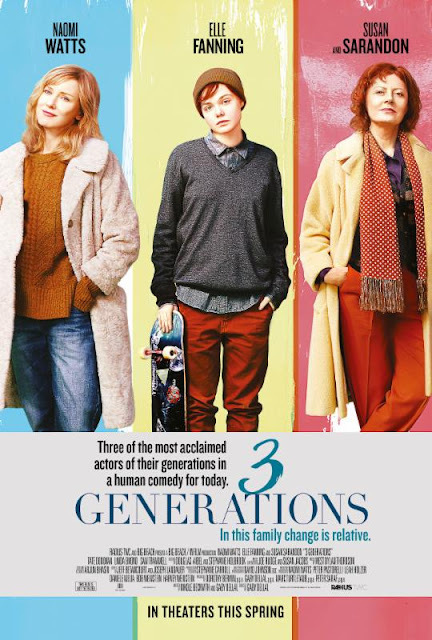 3 GENERATIONS tells the stirring and touching story of three generations of a family living under one roof in New York as they deal with the life-changing transformation by one that ultimately affects them all. Ray (Elle Fanning) is a teenager who has struggled with the body assigned to him at birth and is determined to start transitioning. His single mother, Maggie (Naomi Watts), must track down Ray's biological father (Tate Donovan) to get his legal consent to allow Ray's transition. Dolly (Susan Sarandon), Ray's lesbian grandmother is having a hard time accepting that she now has a grandson. They must each confront their own identities and learn to embrace change and their strength as a family in order to ultimately find acceptance and understanding. Music can sometimes make or break a movie for me. Check out Grammy-nominated singer/songwriter KT Tunstall talk about her experience recording original song "Fit In" in a new featurette for The Weinstein Company's 3 GENERATIONS. Directed by Gaby Dellal and starring Naomi Watts, Elle Fanning, Susan Sarandon, Sam Trammell, Linda Emond and Tate Donovan, 3 GENERATIONS expands to additional cities nationwide today!